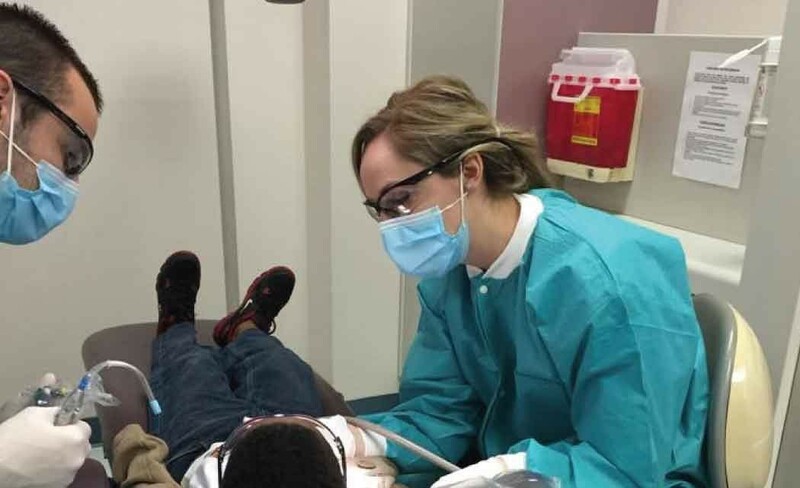 DAVIE — Approximately 320 children got a reason to smile thanks to volunteer dental students and faculty members at Nova Southeastern University (NSU). Nearly 250 volunteers from NSU’s College of Dental Medicine recently provided limited pro bono dental services valued at more than $110,000 to South Florida children ages 2 to 18 as part of Give Kids a Smile Day (GKAS). This was the largest GKAS event at NSU since it launched the program 12 years ago. The event drew children from local Boys and Girls Clubs, religious institutions and other organizations throughout the community. The more than 1,000 attendees, including the children and their family members, enjoyed a fun carnival atmosphere with Miami Dolphins linebacker Koa Misi and cheerleaders, Miami Heat dancers and mascot Burnie, face painters, balloon artists, music, Elsa and Anna from Frozen, robots from Transformers, and campus mascots Timmy the Tooth and Razor the Shark. The U.S. Surgeon General reports that children miss more than 51 million school hours each year to dental-related illness. The Pew Children’s Dental Campaign describes dental care as “the single greatest unmet need for health services among children” in its latest report. Give Kids a Smile events take place annually throughout the United States as part of an initiative started by the American Dental Association to improve access to dental care for children. NSU’s GKAS program is entirely student organized and run. In addition, NSU’s Student Government Association provided financial support to the event. NSU faculty members donated their time to this community service event and supervised dental students in this worthwhile project. Sponsors include Henry Schein, American Student Dental Association and the College of Dental Medicine’s Student Government Association.